Hello dear blogging and stitching friends! It is a hot, muggy day here in the Shenandoah and there is a storm a' brewin'. The wind is nice and the rain will be even nicer. It is good thing that I did not have time to put out a garden this year because rain has been a rare occurance. I have been busy with life and stitching lately. Things are slowing down and speeding up at the same time. I have more time for family and friends and they have quickly scooped up my extra time. No complaints here...it has been quite nice spending time with them. Blackbird Designs "Blessings and Wishes" with the threads and a choice of linens!! Also, she sent me the "Winter Sheep" ornament by Little House Needleworks and a lovely Longaberger pink bag - perfect for taking my stitching on the road! How lucky am I??? Thank you, thank you, thank you, Robin! You are a great stitching friend and I cannot wait to get started stitching on my new stash! This was taken through the window of the church right after we recessed and walked outside...our guests and wedding party were still inside the church and it was the first moment we had alone before people came flooding out of the church. I love this picture and am so glad the photographer caught it! 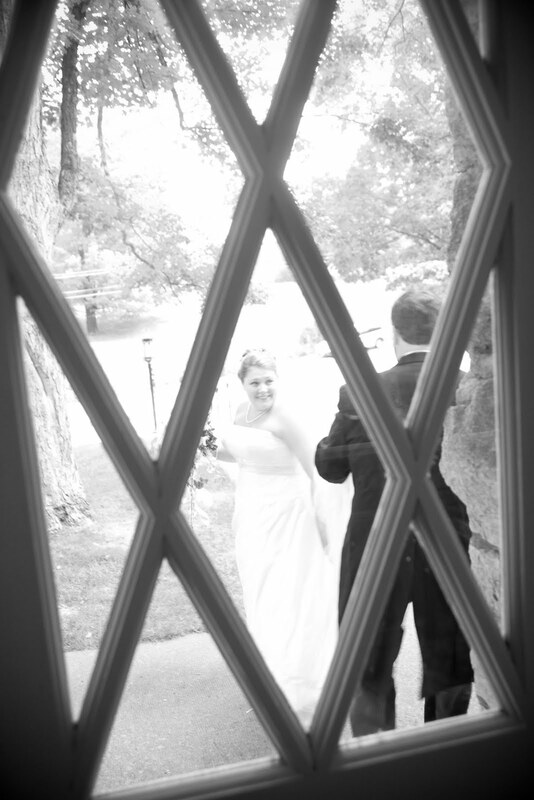 The church where we married dates back to 1756 and many of the windows are original so it is neat to have a picture of us through one of the windows. This was taken before the ceremony in a field right behind the church. 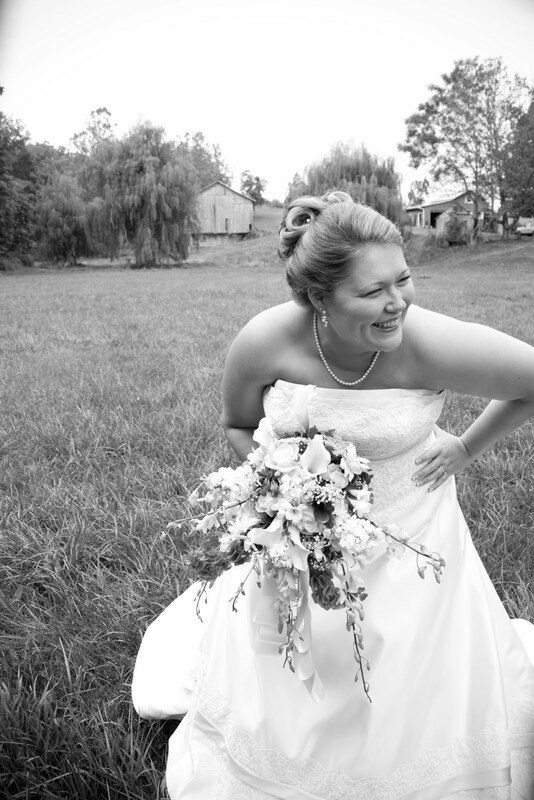 My bridesmaids were making me laugh right before I walked down the aisle. I was having quite a bit of fun and enjoying the day! The next picture was taken on the porch of the mansion. 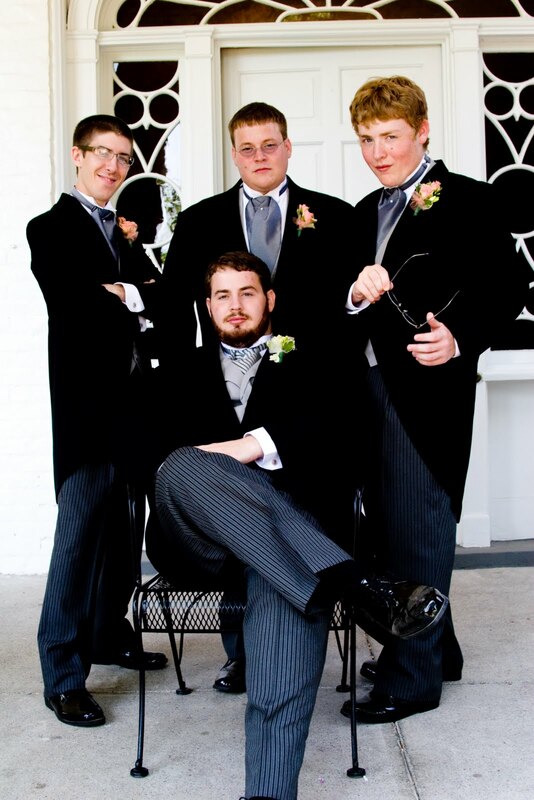 Michael and his groomsmen were, shall we say, channelling their inner "Goodfellas." I chose morning suits for them (since it was a morning wedding) and at first they balked at them. However, I think they eventually liked their morning suits! We had such a glorious day...a morning wedding, luncheon reception and then off to the beach for our honeymoon! Thank you for humoring me and my wedding pictures. I enjoyed looking through them and appreciate your allowing me to share them with you! Till next time dear friends...I promise progress on Richmond Sampler...so keep your eyes peeled! Happy birthday and happy anniversary! You looked like you were having a blast, and the photos are beautiful! And isn't Robin sweet to give such lovely gifts! Happy B-day and Anniversary! What a beautiful bride you were - love the pic thru the window and the one of you in the field looks like a magazine spread - gorgeous! What lovely goodies you got from Robin! Love the Goodfellas picture - your husband is so handsome! Happy birthday and anniversary! My birthday is the same day as your anniversary! Nice presents! And your wedding pictures! So wonderful! You were a beautiful bride! Beautiful setting too, and I love the morning suits the men wore. 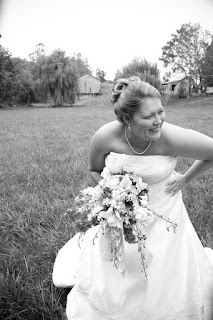 Happy birthday and happy anniversary!I love your wedding photos...you were a beautiful bride! You gift to Michael looks great and what fabulous goodies! Happy anniversary and birthday Valerie. Your wedding pics are amazing, love the black and white ones, and the gorgeous sepia one of you and your dress. What beautiful birthday gifts you received, you lucky girl! The stitching you finished as an anniversary gift is beautiful - that's a very sweet sentiment in the verse. Take care, hope you're having a lovely birthday week. Oh my goodness, Valerie! 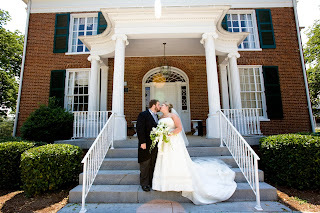 Love your wedding photos! What wonderful memories that you shared with us! Wishing you many more years of wedded bliss! Happy Birthday, Valerie!! And Happy Anniversay, too. Wow so much merrimet all wihin 3 days of each other. What fun! What lovely wedding photos! I love the one that was taken through the window. Congrats on your 2nd wedding anniversary and a belated happy birthday! Some lovely goodies from Robin and it sounds like you'd a lovely day. 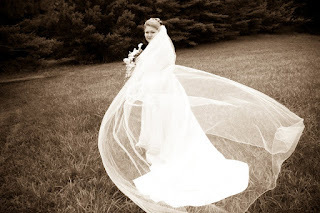 Love your wedding photos, I particularly like the one of you in the field with your veil all around you, that is beautiful! Happy birthday and anniversary too! Your wedding pictures are wonderful. Your photographer got some very good shots. What a month full of celebrating you've had, Valerie... You got some great gifts for your birthday--I especially love the pink and white bag--just gorgeous. I absolutely LOVED looking at your gorgeous wedding pictures. You are a lovely, handsome couple! May you enjoy many more happy years together! Valerie~ Happy Birthday and Happy Anniversary! Yes, time goes by so quickly without us realizing it, then one day it's your 25th anniversary!! You are very blessed to have such wonderful family and friends! Happy Stitching! Happy Birthday and Anniversary. I just love your wedding pictures especially the one through the window and the one of you alone! And of course the one with your husband and the Goodfellas is great too. Wonderful package from Robin too!! Happy birthday and anniversary. Loved seeing your stiching, stash and wedding photos! Happy birthday and anniversary! Your stash haul is awesome. :) I love your wedding photos! They are so pretty! We were too poor (read: ages 18 and 21) to hire a photographer, so we have no photos of our wedding day other than a couple really bad snapshots. boo! Oh Valerie, I love your wedding photos! My favorites are always the candid shots like the ones through the window and of you laughing. Such a beautiful bride! Happy anniversary and birthday. I'm so glad DH liked his present. Please post a pic when it's framed! A belated happy birthday and anniversary! 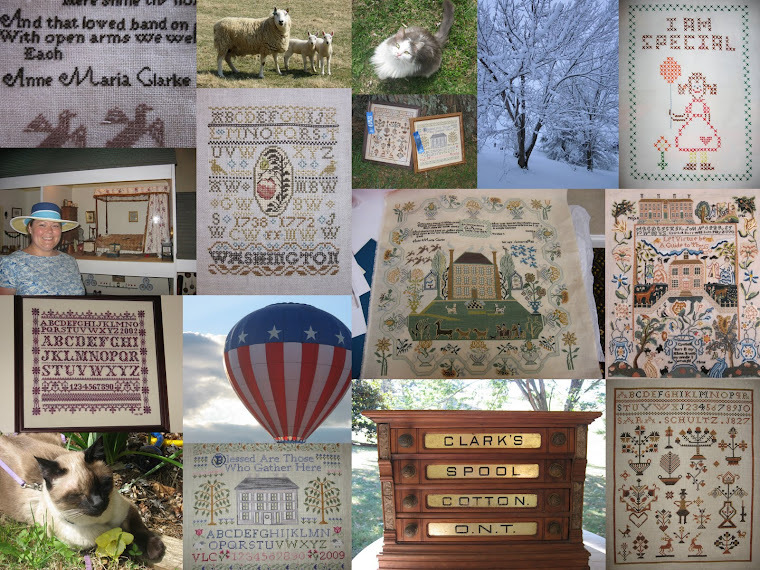 Beautiful sampler you stitched and great gifts you received. Thanks for sharing the photos.